The Community Rights Program was launched in 2008 to confront corporate power at its core: changing our legal system from one that protects the rights of corporations, to one that protects the rights of our communities and the Earth. During its five active years at Global Exchange we supported communities to defend against pesticide toxins, stop fracking, protect water rights. We covered a great distance, from Mendocino to Culver City, California to India, Ecuador and Bolivia. 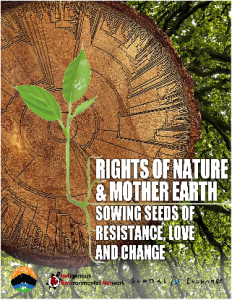 Community Rights and Rights of Nature laws strip corporations of personhood rights, recognize the rights of nature to exist and thrive, and most importantly subordinate corporations to local democratic control. 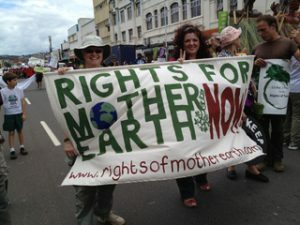 RIGHTS OF NATURE: Global Exchange’s Community Rights Program helped pioneer the growing Rights of Nature Movement. Global Exchange attended the World People’s Conference on Climate Change and the Rights of Mother Earth in Bolivia; inside and outside meetings at the UN Conference on Climate Change (COP) in Mexico (2010) and South Africa (and Peru with Movement Rights); and the Rio+20 conference in Brazil, speaking at the first United Nations event addressing people’s connections with Nature. We led a Rights of Nature Reality Tour in India, with Dr. Vandana Shiva; strategized and provided support to activists in Ecuador (where we co-founded the Global Alliance on the Rights of Nature! ); and convened 32 global social movement leaders including Indigenous leaders, deep ecologists, grassroots justice advocates, economists, climate experts, localization activists, globalization thinkers, writers and researchers at the Rights of Nature and the Economics of the Biosphere Summit here in California. RIGHTS BASED ORGANIZING: Focusing on California, the Community Rights Program answered hundreds of calls from communities at risk, to provide guidance and direction and take action to re-write laws to protect against corporate power. Over the years, Global Exchange hosted Democracy Schools and worked closely on campaigns in Mt. Shasta, Santa Monica, Nevada City, San Luis Obispo and Culver City, with a side trip to Occupy Wall Street. In 2014 & 2015, the Program focused on banning fracking and toured the state to work with communities to ban the dirty practice, spending most of our effort in Mendocino County. 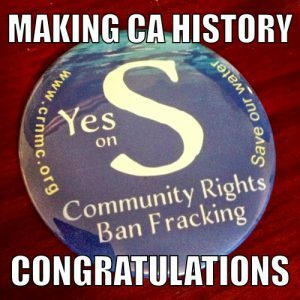 After an incredible year of collaboration with the Community Rights Network of Mendocino County (CRNMC), Measure S was passed in November 2014 by the voters of Mendocino County – making history as the first California community to adopt a Community Bill of Rights, placing their rights above corporate interests. After years of success, Global Exchange is proud to see this work transition to Movement Rights. 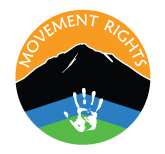 Visit the Movement Rights website at www.movementrights.org.